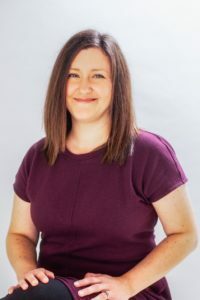 I am a registered yoga teacher (RYT 200), Sekoia™ Yoga teacher and Reiki practitioner. I began practicing yoga more than 10 years ago as a means to feel better, inside and out. Along the way, I discovered that when you feel better, you can live better. During class, I strive to offer a welcoming space to help students establish or deepen their yoga practices while exploring movement, breath and meditation. Contact me for information on private group lessons or events. To sign up for email updates about upcoming classes or workshops, click here. Drop-in cost is $10 per class. Cash and credit card are accepted. 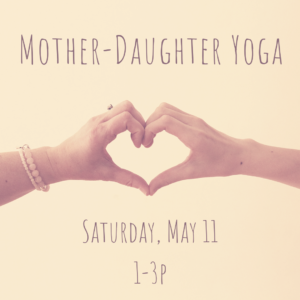 Spend quality mother-daughter time during this 2-hour class that includes partner yoga poses, meditation, breathing practices and a journaling activity. After the yoga practice, enjoy light snacks and pose for a picture of your favorite partner pose (if you want to!). This event is for ladies ages 12 and up, and their mothers — or aunts, grandmothers, etc. — to enjoy together. Groups of 2, 3 or more are welcome. No yoga experience is needed. Attendees will receive a flower, small journal, bottled water and light snacks.